Playlist Folders allow you to publish a single playlist player from which your viewers can choose which playlist they would like to watch from a drop down selection of all the playlist you made available within the Playlist Folder. If you want to check out some demos and and extra information please visit our Playlists information page. To create a playlist folder you will need to click on the ▼ Playlist Folders section in the left media bar. This will expand the currently available playlist folders. With the Main Playlist Folders Category selected we can create a new playlist folders by clicking on the ➕New Playlist Folder button located in the top of our current Central Media View. 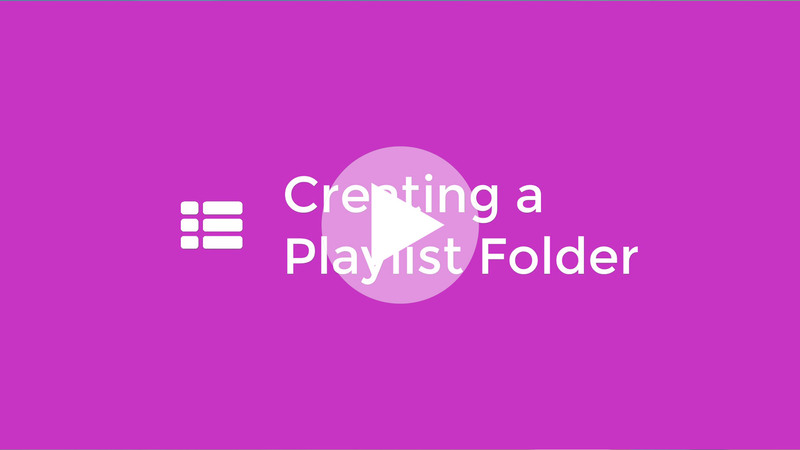 This will open a pop up asking you to type in the Title of your new Playlist Folder. Once you have typed your desired name simply click on the green Confirm button to create the new playlist folder. We can now see the newly created playlist folder in the Central Media view as well as in the left Playlist Folder menu. You are now ready to add Playlists to your Playlist Folder.